So my, mostly, fearless young maiden and I went out in the sunshine to find the wind blowing thirty miles an hour. It shook the trees, brown leaves skittered and scattered over the frozen ground. Willow tried barking at the gusts. That didn't stop them. She'd whirl around to face them when they ruffled her fur from behind. She pounced on every leaf that tried to attack her as it raced over the icy snow. Even though the powerful gusts startled her, she'd fight back in her little pink harness with her tail wagging. Girl power! Now she's on her bed and out for the count. Hanne, Sharon7, Sandy in CT and 2 others like this. What a wonderful journey you are having raising Willow. She sounds like such an awesome dog. Really look forward to your stories about her, it brightens my day. 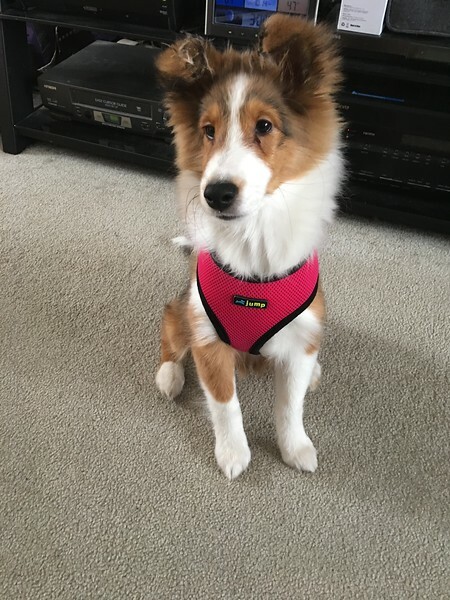 Need a pic of her in her harness! Okay, here she is just before we went out walkies, which is a whole other story I'll relate after the picture. We went out in the sunshine to walk. Everything here is frozen solid but the path through the park has been plowed. Here's Willow enjoying a bit of exploring. On the way home, a blizzard-like snow squall jumped up. Then we enacted a scene straight out of Lassie. I slipped on a sheet of ice that had a light dusting of snow on it and went down hard lying flat out, face down, on the ice sheet. Willow came right to my face to see if I was okay. Other than a bloody knee and a few aches and strains I think I am. It took me a while to get back on my feet and she hovered and nuzzled me the whole time. We walked the rest of the way home with her walking a perfect heel, sticking to me like glue. I don't know if she was worried for me or for herself. I certainly can't recommend it as a training maneuver but it was pretty amazing. She's now back in her usual position, between my feet. I think that's more than enough excitement for one day. Jams, Calliesmom, Hanne and 1 other person like this. OMG what a terrible fall to go down face-first! I'm glad all you got was a skinned knee and some strains. Could have been much worse. What a good girl Willow is to make sure you were OK. Sounds like you didn't hit your head, that's really the main worry. I hope you don't feel too beat up tomorrow. I'm very glad you're OK! That sounds like a nasty fall. Isn't it amazing how intuitive Shelties are? Even as puppies, they seem to know when it's important to take care of their people rather than running after squirrels or other fun things. Good girl, Willow! Jams and Sharon7 like this. Oh my...I'm glad you weren't hurt worse but you'll no doubt be feeling it more tomorrow! What a good girl Willow is sticking close to you like that! You're right, it hurts quite a bit today but at least there's nothing broken. I hope to be out walking Willow by Monday. Right now she's in her usual spot, sleeping between my feet. She had a vaccination today and was a very good girl at the vet's. The vet loves her and she loves the vet. The vet said she was fearless and in great shape. That was good to hear. Sharon7 and Ann like this. So sorry you fell! OUCH! Hate the ice! So you are Canadian? Hubby is a Newfie..
Amazing Willow picked up on your hurts and was so attentive and well behaved. Smart girl for one so young!